The fitness industry has never seen anyone like Robert Irvine, who has the credibility of not only being astoundingly fit, but the reputation of a world-class chef who would never settle for the bland grilled-chicken-and-broccoli diet that you’d assume would be necessary to maintain his considerable physique. He loves to eat well, doesn’t make any compromises, and doesn’t want you to, either. FIT FUEL contains 37 total recipes for breakfast, lunch, dinner, and dessert—all explained with simple instructions and shown in gorgeous, yet realistic photography. No matter what you’re in the mood for—eggs, pancakes, soups, salads, sandwiches, beef, chicken, fish, or something sweet—you can have your pick as Irvine shares the delicious gourmet recipes that have allowed him to walk in both worlds, satisfying both his fitness goals and his palate. One third of Fit Fuel is dedicated to training, where Irvine demonstrates through A and B photography and explains in everyday language the training techniques that built the foundation of his physique. The reader is presented with an easy-to-follow plan that can be followed in perpetuity. Packed from cover to cover with information and inspiration, Fit Fuel is a book as useful for men and women looking to maximize their fitness levels as it is for those who have a hard time looking at themselves in the mirror. 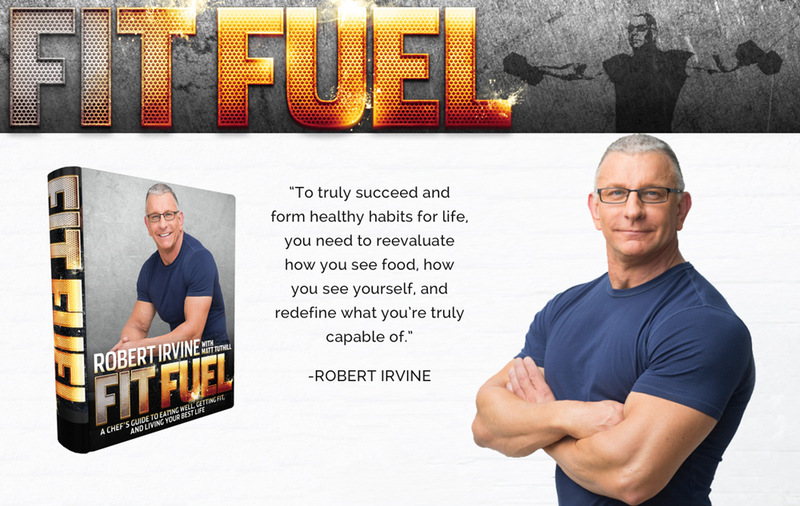 When you are finally ready to achieve your full potential, all the information you need can be found in one book, and Robert Irvine will be with you every step of the way.